Winter was slowly receding and reluctantly relinquishing its hold to permit spring to venture forth. The outside world was nevertheless still gloomy and low-spirited. 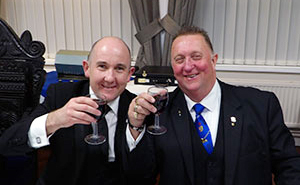 But the opulent lounge bar that serves the needs of the members of the Masonic Hall in Blackpool was teeming with kindly and chirpy patrons eagerly awaiting the start of the installation meeting of Mereside Lodge No 6360. Gallant Masons were in abundance. Barry Lee (left) with Kevin McCumiskey. In the immediate locality of the bar stood the prime host, master of the lodge Kevin McCumiskey, quietly contemplating the imminent ceremony. Farther afield and imbibing the atmosphere was the cheery principal guest of the day, Geoffrey Pritchard, who was circulating with the masses and sharing the warmth of his geniality. Director of ceremonies Brian Burgess-Dicks was calmly confirming last minute details of the forthcoming event. Indeed, the entire ambience of the room was generally relaxed and in genteel mood. Some sat in restful silence, absorbed in his own thoughts, perhaps privately rehearsing his allocated ritual. All in all, it was a scene of tranquil expectation and peaceful confidence. Mereside Lodge members are generally cheery individuals but, on this occasion, their cheeriness had elevated above their norm. The installation was to be a special occasion. 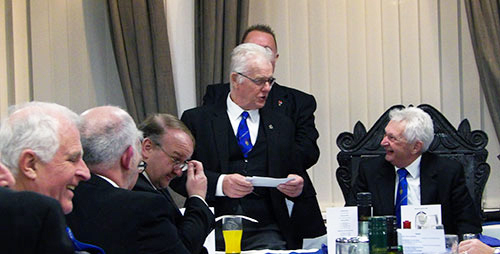 The new master was to be stalwart of the lodge Barry Lee. Barry had previously been master of the lodge in 1980 and during his forthcoming term of office, he is to celebrate his 50 years in Freemasonry. Little wonder that the atmosphere was particularly chirpy. Joining Geoffrey Pritchard amongst the list of notables was Chairman of Blackpool Group John Turpin, group vice chairman David Cook, group secretary Steve Jelly and acting Provincial grand officers Clive Gitsham, Jim Finnegan, David Kenworthy and Peter Maxwell. On entry of the notables into the lodge, the enormity and importance of the task facing Kevin McCumiskey seemed to suddenly dawn on him and the jitters began to fray the nerves slightly. Under the calming guidance of director of ceremonies Brian Burgess-Dicks however, Kevin soon regained his composure and authoritatively conducted the ceremony with sincerity and charm. Fortifying the steadying influences still further by appointing experienced Masons, Michael Burnett as installing senior warden and Malcolm Hyland as installing junior warden, along with the master of Great Marton Lodge No 3985 William Barrow as installing inner guard, Kevin gained confidence with every passing moment and he placed Barry Lee in the chair of King Solomon in fine style. The ‘light blue’ working tools trio, pictured from left to right, are: Peter Roscoe, Karl Taylor and Alan Langridge. Barry, safely decanted into the chair, beamed with delight at each and every portion of the ritual. Having invested Kevin with the immediate past master’s jewel and collar, Barry sat back to enjoy a first-rate rendition of the 47th problem of Euclid. When John Bellhouse gave the address to the immediate past master; a complex piece brought to life by John with his lively yet precise delivery, it was a sign of things to follow and what followed was an absolute joy. Displaying little or no nerves, three ‘light blue’ Masons thrilled the gathered throng with their presentations of the working tools of each degree. Briefly relinquishing the assistant secretary’s chair, master Mason Peter Roscoe confidently orated a faultless rendition of the working tools of the third degree and Karl Taylor, also a master Mason, provided an equally impressive explanation of the working tools of a fellow craft. But the performance that earned the greatest admiration was that of entered apprentice Alan Langridge who presented the first degree tools; a magnificent display from a young Mason who had been initiated only four months earlier. 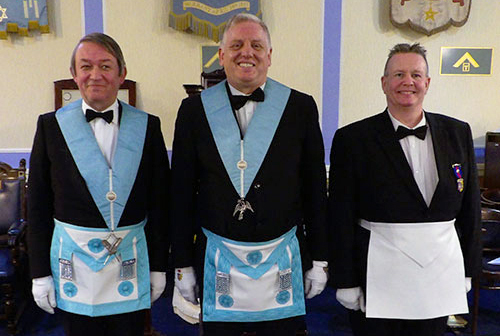 Michael Burnett and Malcolm Hyland demonstrated their mastery of ritual in investing the new senior and junior wardens respectively whilst Harry Waggett, organist for the lodge, displayed his virtuosity with a sincere and passionate address to them. Visitors who had been seconded to perform in the ceremony were similarly impressive. Regional care officer Peter Mann brought authority to his address to the almoner, whilst group charity steward Ian Stirling provided a comprehensive explanation of the duties of the charity steward, including his responsibilities as festival representative. Jaunty lodge mentor Jim Finnegan confirmed his legitimacy with a superb address to the stewards. Kevin McCumiskey (left) celebrating with Brian Burgess-Dicks. Brian Burgess-Dicks, with zeal and gusto, perrormed a first class address to the newly-installed master and Geoffrey Pritchard rounded off the proceeding with a passionate and articulate address to the brethren of the lodge, bringing the ceremony of installation to a fitting end. Kevin McCumiskey sighed with relief and a cheery smile resumed on his face! 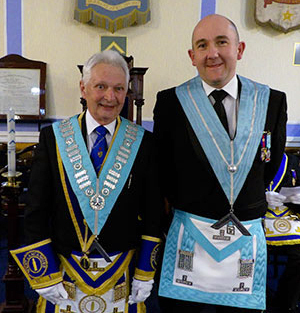 Geoffrey Pritchard, always sporting a warm and cheery smile, was exuberant in his praise of the ceremony when he rose to convey the greetings of the Provincial Grand Master Tony Harrison. He congratulated Kevin on the manner in which he had conducted the ceremony and on how he had so well overcome his initial nerves. In addressing Barry on becoming the new master, he was particularly enthusiastic. Geoffrey has known Barry from the time of his entry into the fraternity and, as a fellow 50 years in Masonry celebrant, the joy of seeing Barry installed into the chair of the lodge again was clearly evident. His pleasure was heightened by the performances of the three ‘light blue’ Masons who had so superbly presented the working tools and Geoffrey was keen to express his admiration to the full. The quality of ritual is not the only component of an installation that makes it memorable. Charitable disbursements are also a fundamental element and Mereside Lodge scored an ace in this category too. £400 (excluding almost £600 that had already been forwarded to United Grand Lodge) was given to the Masonic Charitable Foundation 2021 Festival, £250 to the West Lancashire Freemasons’ Charity, £830 to Woodlands School, £200 to the British Heart Foundation, £100 to the Blackpool Masonic Club, and £20 to each of the Masonic bowling, fishing, golfing and shooting societies. It was a magnificent total and a credit to the lodge and its members. Geoffrey Pritchard in full swing during his response to the toast to grand officers. It was not surprising therefore that it was with a spring in their heels that the gathering retired to the festive banquet and continued their revelry; no doubt stimulated by the obvious pleasure that permanently remained on Barry’s face throughout the proceedings. He could not have been happier had it been his first time in the chair and one can only speculate on his cheeriness when he celebrates his 50 years in Freemasonry in October. Readers familiar with Geoffrey Pritchard’s speeches will readily concur that, when jocularity is the order of the day, one cannot select a more appropriate speaker to respond to the toast to grand officers. He possesses an enviable skill of combining humour with seriousness; apprising his audience with pressing Provincial communications in a most entertaining manner. Even serious topics like the Masonic Charitable Foundation 2021 Festival or recruitment, retention and retrieval of members are delivered with cheery and amusing anecdotes. He has a rare talent that is always appreciated by the gathered throng. Also always appreciated by the throng is Harry Waggett’s rendition of the master’s song, superbly accompanied by George Holden at the piano. Harry adds his personal touch of charm to the song and, being a member of Mereside Lodge, made it especially poignant to the newly-installed master. The whole evening was a delight from beginning to end and Barry Lee is assured of a second innings of fun and pleasure. Roll on October for another superb evening in celebrating his 50 years in Freemasonry! Pictured from left to right, are: Jim Finnegan, Peter Maxwell, David Cook, Geoffrey Pritchard, Barry Lee, Kevin McCumiskey, John Turpin, Brian Burgess-Dicks and Clive Gitsham.